Aquaman is blinded after being hit on the head by falling rocks. Finny Friends Report: Aquaman rides his trusty sea cow steed throughout this story. Aquaman has two whales propel him at the motorboat so he can take out one of the hijackers. He has a swordfish cut him free from the net. A sea eagle takes the club from the hijacker. Captured/Knocked Out report: Aquaman is hit on the head by rocks from a landslide, which knocks out his vision. He's captured in a net by the hijacker boss. Later, he slips on the wet deck of the hijackers' boat and hits his head again... restoring his vision. Quotefile: Hijacker, "Hey-- look... Aquaman's lost his eyesight! This is our big chance... Elmo, hop into that small speedboat!" Elmo, "I get it, boss! I'll run him down so hard he'll never know what hit him!" How the bad guys figure out that Aquaman has lost his eyesight simply by viewing him from a distance is never explained. Another in a long line of stories that take away Aquaman's abilities. Some examples: can't swim, can't touch water (twice), can't breathe air, attacked by fish (twice), and can't talk to fish. The boss of the hijackers is never named, but his two companions are Elmo (who Aquaman gets rid of first) and Joe... or is it Charlie? The second hijacker is named twice, both times by the boss, and both different names. We could explain this by saying that the boss doesn't care about his hired help enough to even remember his name. So I get a no-prize? You can tell which hijacker is the boss by his nifty hat, which is knocked off his head by the sea eagle. After that you have to look for just the stylish yellow tie and red jacket. 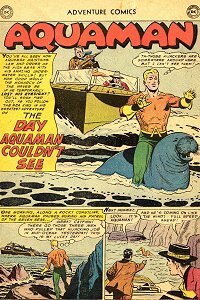 I'm kind of sad that Aquaman's sea cow is never named. He's been in lots of stories.